Trainers have used Lasix for decades to reduce bleeding and improve performance in North American racehorses. (Inside Science) -- This Saturday, a 3-year-old colt named Justify has a chance at achieving one of American thoroughbred racing’s most treasured accomplishments -- the Triple Crown. The race should be fair, but it won’t be entirely clean. About four hours before the scheduled 6:37 p.m. start of the Belmont Stakes, Justify and all of his competitors will receive a controversial, performance-enhancing drug widely used in American thoroughbred racing since the 1970s. The therapeutic drug called furosemide, or Lasix, is a longtime hot-button issue in the horse racing industry. Its therapeutic purpose is to prevent blood from entering the lungs, which is called exercise-induced pulmonary hemorrhage. The drug causes the horse to eliminate an abundance of urine, which decreases hydrostatic pressures in the horse’s body that could otherwise surge and cause air sacs in their lungs to burst. The fluid loss results in the horse losing 20-30 pounds -- a benefit come race time. Nearly every trainer in America gives Lasix to their horses before a race, in contrast to accepted practice in most other countries. A galloping horse inhales deeply when their legs come together beneath them and exhales powerfully when their legs land outstretched. The animal’s robust heart and contractile spleen work together, pumping vast amounts of blood into the blood vessels of the lungs. The volume and pressure of both the blood and air entering and exiting is so forceful that it can break through the thin blood-gas barrier of the alveoli, causing blood to enter the lungs. 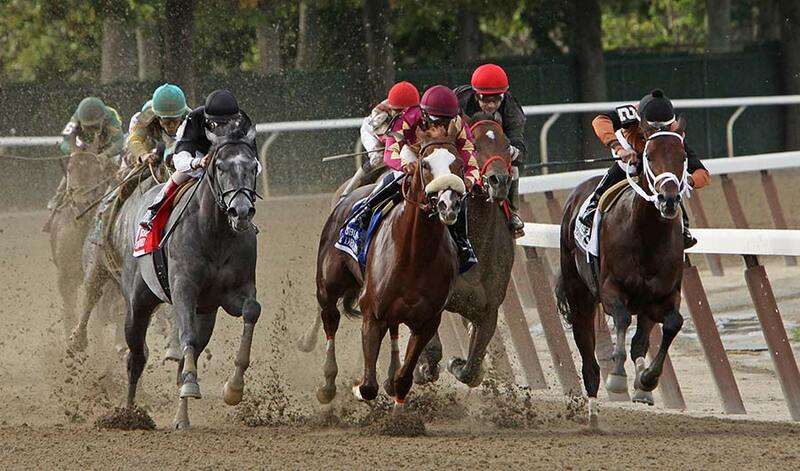 It’s estimated that around 90 percent of racehorses experience at least some amount of bleeding. And in about 3 to 5 percent of horses, lung bleeding causes nose bleeds. In most cases, a veterinarian’s endoscopic examination confirms bleeding. Horses also tend to bleed more the more they run. They recover, but only after suffering permanent lung damage. Repeated bleeding is thought to cause inflammation, tissue damage and decreased lung capacity. In rare instances, it’s fatal. That’s because Lasix is a diuretic developed to reduce excess fluid buildup caused by liver or kidney disease, heart problems or high blood pressure. It inhibits the absorption of minerals in the kidney, which results in increased urine production. The Lasix-related urine release lowers hydrostatic pressures in the horse’s body, which decreases the severity of bleeding by 50 to 70 percent, although it doesn’t eliminate the risk completely. Most racing centers outside North America don’t allow Lasix. Japan, Australia, the United Kingdom and others permit Lasix during training but prohibit it on race days. In Germany Lasix is prohibited at all times. Gorajec is a vocal supporter of the Horseracing Integrity Act of 2017, a federal bill that puts control of all drug testing and regulations in the hands of the U.S. Anti-Doping Agency -- the same group in charge of professional athletes. The act, which would prohibit race day administration of Lasix, is opposed by many in the industry. Bleeding is an inherited trait in racehorses, so with controlled breeding, it’s possible to remove the trait from the gene pool. In Germany, owners are not allowed to breed horses that are known bleeders. But prioritizing winning bloodlines has led to a relatively inbred population of bleeders in North America. Another option is equine nasal strips, developed by veterinarians in the mid 1990s. The butterfly-shaped strip goes across the top of the horse’s nose and opens the nasal passageway, decreasing resistance to breathing and decreasing respiratory pressure. Similarly to Lasix, the strips don’t completely prevent bleeding, but a recent clinical trial reported about a 50 percent decrease in severity. However, relatively few horse owners or trainers use the strips because their horses don’t run as fast as they do when they lose weight with Lasix, said Poole. Editor's Note (12:00 pm, June 8, 2018): This story has been edited to remove the misleading statement that I’ll Have Another and California Chrome competed without Lasix. According to information from Equibase, an organization that collects thoroughbred racing information and statistics, both horses regularly raced with the aid of the medication. We regret the error. Kimberly Hickok is a science writer based in Santa Cruz, California. Follow her on Twitter @kimdhickok.